Title: The Carrot's Lament. 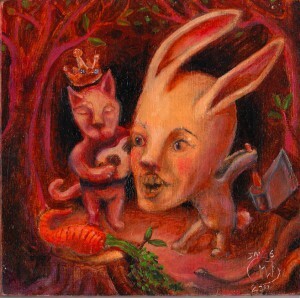 Medium: Oil on Panel, Cardboard Frame Date: 01/06/2011 Dimensions: 4" X 4" Description: Another rabbit and carrot themed mini-painting done in early 2011. I'm really fond of this little painting. In person it glows and has depth of color that just works. It's also got a lot of contained energy in it like a grenade. The carrot, the object of desire, is getting the axe, I find that refreshing. Now in a provate collection.